Last night, EA held an event to showcase some of their new titles coming out for the coming winter and spring. Fantastic indeed, and in addition to all of the games the company has been developing over the last few years, Electronic Arts felt privy to hint at two brand new titles, Warp and Gatling Gun. XBLA and PSN titles, these are brand new games coming to the services sometime next year. The first title, Warp, is a result of EA Partners, a publishing deal with Trapdoor. Little is known about the game, other than it is a top-down sci-fi puzzler, and has stealth action elements. That could mean a lot of things, but I'm looking forward to what the Montreal-based studio will do. Gatling Gears is a lot more interesting,mostly because EA actually showed off screenshots from the game. 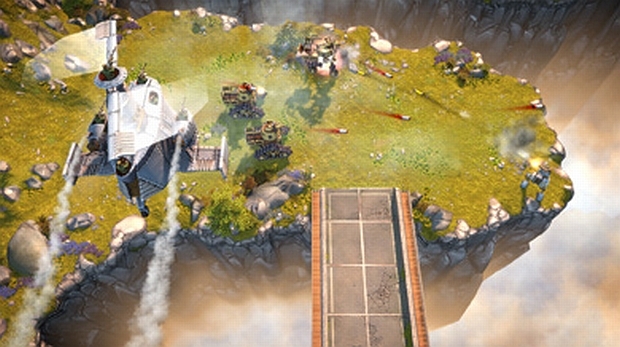 While twin stick shooters are a dime-a-dozen on XBLA and PSN, Gatling Gears takes this gameplay and places it in the Mistbound universe, the fictional land last seen in February's Greed Corp. Vanguard Games promises to make an action oriented version of Greed Corps, and those who remember that older title will recognize the steampunk aesthetic and general feel. Considering this is just the second in a planned series of Mistbound titles, it's kinda cool to see a franchise actually pull off an ambitious project across multiple games. So what do you think? With very little to go upon, do any of these sound interesting?